Friday Another ride from Santa Margalida. The sun shone all day and we completed the ride in shorts and short sleeved tops. We parked in our usual spot and took the minor tracks to Maria and then on towards Petra. Just before Petra we turned towards the pretty village of Ariany. We climbed the small hill and stopped for a coffee in the village square. The village seemed to have 2 bars and a pub crawl would involve a walk of 6 feet. The coffee was excellent value at 1.2 euros and so much more pleasant drinking with the locals than sitting in one if Petra's busy squares. After coffee we tried to locate the mountain bike track that would have taken us across to the Bosch valley. Not every path is marked on our map but the track was eventually located. However it was gated and marked as private . It was whilst look for the track we saw our second Testuda Hermanni Hermanni Mallorca. This time a larger specimen out 10 inches long. Defeated we followed the minor track to Petra and then climbed the 317 meters to the church at Botany. It has excellent panoramic views looking down on Petra and also out to the sea. Lyn managed the climb to the top without stopping and some of the sections were steeper than the 4 % indicated on the map. 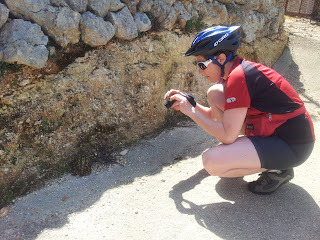 We then took the steeply descending mountain bike track and then road towards Sant Joan . We were hoping for a late lunch and although the village had a couple of bars they were not serving food . Rather than continuing straight to Sineu we took the short detour to Loret de Vista Alero and the bar we had spotted earlier in the holiday . 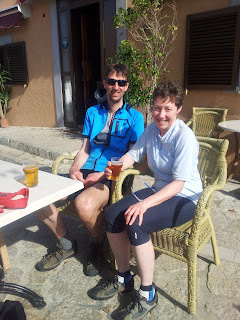 A couple of vegetable filled crepes and a small beer later and we were ready for the last 10 miles back to Santa Margalida via Sineu. The free range pigs we had seen in previous years we still in the same field . We watched a sow suckling 11 piglets before gental climbed back to the football stadium and the van. A round trip of 42 miles . On returning to Port de Pollenca we had time from a paddle in the sea and found ourselfs surrounded by Hermit crabs and their assortment of shells. Thursday .A ride to the South of Lucmajor . The plan when we set off was to park at Sant Jordi near the airport and start a ride from there. 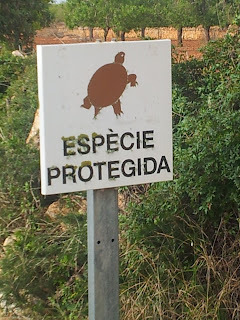 However when driving to Sant Jordi we realised that the roads we had planned to take around the airport were very busy and so instead we drive further round the coast and parked in the residential development of Bahia Grande. We set off on the minor road towards Lucmajor . We missed the turn we intended to take but had the consolation of cycling on a pretty track almost all the way to Lucmajor. 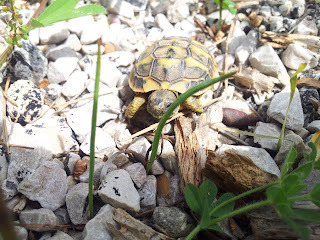 It was then along the Cami de Palmer and back towards the coast on the Cami de Cala Pi.It was when Lyn stopped to photograph some flowers when Robert spotted a small tortoise apprximately 2 inches across ,Testuda Hermanni Hermanni Mallorca,soaking up the sun. We took several photographs before leaving him to enjoy the sun in peace .We continued on our way ,when we reached the Ma 6014 we crossed and continued to the unfinished development of Valigornera. We had intended taking the mountain bike track round the coast for a couple of miles to S'Estanyol de Migjorn. However Lyn found it to rough as retraced our steps and cycle the 7 miles to the town. It was now nearing 4pm and we were overdue our lunch ! The problem was solved by the Es Mallet de S'estanyol on the main road by the marinia . A three course menu of the day for 9 euros and that included a bottle of wine between us. We selected an excellent potato salad with tuna and egg to start . We shared the main courses of chicken with garlic and fried fish and both had cream caramel to finish. We then continued the 1.5 miles along the coast road to Sa Rapita before cutting inland and making our way back the 16 miles to Bahia Grande . Our cycling map at a scale of 1:100000 suffers from the draw back that not every path and track is shown . It was whilst examining the map we had our second wildlife siting of the day when a Pine Martin crossed the road. Turned to look at us from the wall then disappeared into the bushes. We were late back to the apartment , Lyn was full from her lunch do we had a snack in before setting of to see Bony again. A sangria later and we were ready for a portion of chips from the chip stall. They even have a draft beer pump so you can have a drink whilst you are waiting for them to cook. You do not get that in England. A good days cycling a round trip of 46 miles. Friday . First day cycling where we started cycling without a jacket . Lyn does not like to miss out and after my climb of the Orient yesterday and almond cake in Alaro she wanted to see for herself . We parked in Biniali again but this time head north and joined the Cami de Muro or "water road ". We followed this to Santa Maria and then took the minor road up to Alaro . We arrived at lunchtime. I had cunningly delayed the start of our ride by having to drive back to the apartment for my cycling shoes to ensure we arrived at a suitable time. The bakers were still open. We quickly selected a meat and vegetarian pie for lunch but Lyn had a dilemma with the cake . In addition to yesterdays almond cake the baker had a chocolate cake and light fruit cake with walnuts on the top. The almond cake was eventually selected and we had lunch in the main square. After lunch it was the climb of the Coll de Orient , 5.2 km at 5.1%. After the climb we dropped down to the village and had a poor value coffee and piece of cake. Rather than continuing to Bunyola and having to go on the busy road back to Santa Maria we retraced our steps and enjoyed the descent to Alaro and followed the minor roads round to Moscari . Our "usual bar" was open so we stopped for a small beer. 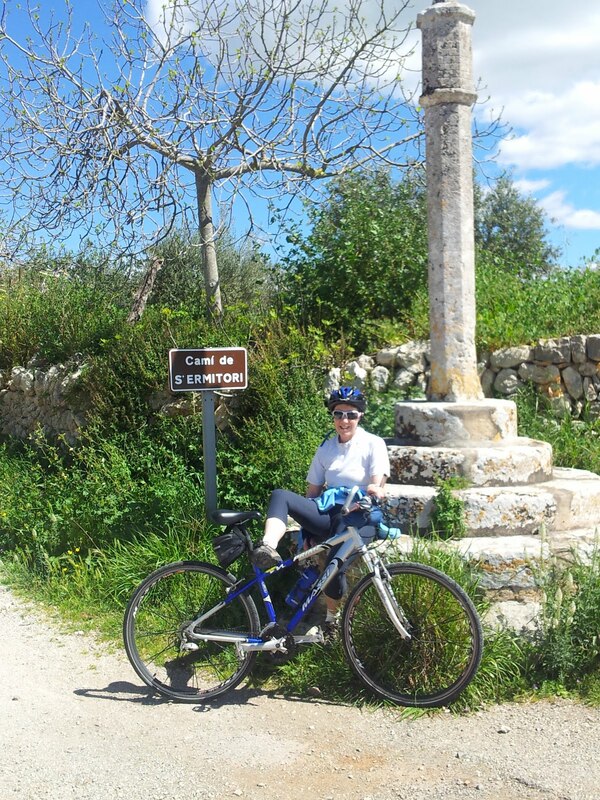 We would normally have continued on to Campanet and then Port de Pollenca but as the van was in Biniali we then took the minor road to Inca where once we had negotiated a couple of busy roudabouts we got back onto the cycle path which eventuality took us to the Cami de Muro. We followed this for around 7 miles , this time against a stiff head wind , before turning and retracing our steps back to Biniali . A round trip of 46 miles. The temperature rose though the the afternoon and must have reached 20 degrees plus. Another good ride. Oh Lyn found the Almond cake to sweet and I agreed . It must have tasted different after 60 plus miles and 4 main climbs! Over 88 miles and 2464 metres of climbing. Lyn wanted a rest from cycling so I had a day in the mountains. Bruce correctly describes the ride as a day to remember . A summary of the route is Port de Pollenca , Pollenca , Lluc ,Puig Major , Soller, Bunyola ,Orient ,Lloseta ,Selva, Campanet and then back to Port de Pollenca. freshly cooked piece of Almond cake. It was excellent at set me up for the 30 miles back to Port de Pollenca . The sun shone all day with the temperature peaking at around 25 degrees . I wore a long sleeve top and windproof jacket for the mountains but would have been fine in a short sleeve top today. My windproof top sleeves we unzipped before the first climb and stayed in my back pocket for the rest of the day along with my "legs". An excellent days cycling. I got back to the flat to find Lyn about to brave the pool. Sue would have been proud of her. I will post a photo later to prove it. A ride from Sa Pobla. Parked in our usual spot by the cemetery . Took the Ma 3501 towards Inca and turned of on the minor road past Can Ganancia to the Ma 3500. A mile down the road we joined the Cami Vell de Muro or water road. We continued on this for about 8 miles and then turned on a minor track to Sencelles . Lunch was taken in a cafe in the town . We shared a bowl of lentil soup an a pa amb oil. It was then going to be about 16 miles back to the van but the route expanded to another 26 miles. 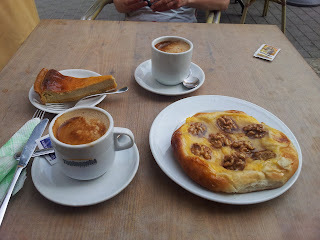 We took the minor tack to Ruberts and then went back via Lloret de Vista Alegro ,Sineu, Llubi and Muro for a cake stop . A round trip of 38 miles. We cooked tea in the apartment and then cycle into the town for a drink at Bony's bar. The last time we we there was 2 years ago when I came off my bike when cycling over an unmarked chain going into the square . Our bikes we store overnight in his bar whilst I had a trip to the hospital to get checked out. Bony remembered us and the accident . I must have been the talk of the town! The rain had departed and a fine day was forecast so after our rest day it was time for a ride in the mountains . We started by taking the backs roads to Campanet . Just before Campanet we stopped to look at Ses Font Ufanes . They were on a path about 1 mile from the road and we think were meant to be a natural fountain .They only appear after heavy rain but all we saw was a dribble and a small steam. Roberts mileometer tried to escape as we cycle back down the track to the road. Fortunately when we set off to look for it it had been found by a group of walkers .It was then up the hill to Campanet and back roads to Calmari via Binibona. 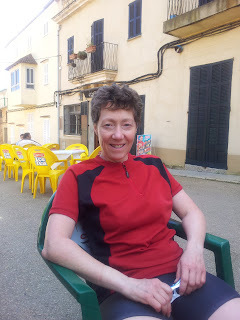 A coffee in a bar refreshed us for the climb of the Col de la Sa Batalia (570m) around 7.9km at an average gradient of 5 percent .For the second year running we dont have photos the ascent up as Lyn made it to the top again without stopping. Robert had hoped to climb Sa Calbra again but as we riding the 5 miles to the start of the col we realised a more sensible idea was having lunch in a warm restaurant by the start of the Torrent de Pareis . A Spanish omelette and a beer later we returned to Pollenca via Lluc . The temperature on the top was around 10 degrees but it warmed up enough on the descent for an icecream in the square . The long sleeve top and legs I selected in the morning seemed over the top when the sun came out but required at the top of the climb. 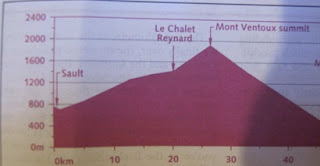 A 48 mile ride with around 986 metres of ascent. Awoke to the forecast rain and a very black sky. The plan was to stay dry by doing the driving tour 1 from the Sunflower Landscapes of Mallorca. The route started in Palma and as we approched it the sun came out. We the followed the Ma1C and eventually arrived at the pretty upmarket finishing village of Port d'Andratx. The wealth of the tourists could be judged by number of estate agents offering million plus euro apartments . It was then on to D'Andratx about 3 miles in land. Lyn's research had found it should have been having an agricultutal show . Once we located a car park we walked round the town but could not locate the fair .We were 8 hours too early for the beer and tapas in the main square. Next was Santa Elm. Locating the car park proved a challenge with ever street looking the same. After a couple of wrong turns the car was located. The challenge next was getting out of town and locating the minor road to Santa Elm. After a couple of tours round the one way system, and a drive past the local sports stadium we opted for the more direct main road. Sant Elm proved to be a pretty little town and had views across to the Parc Natural de sa Dragonera , an island just off the coast. 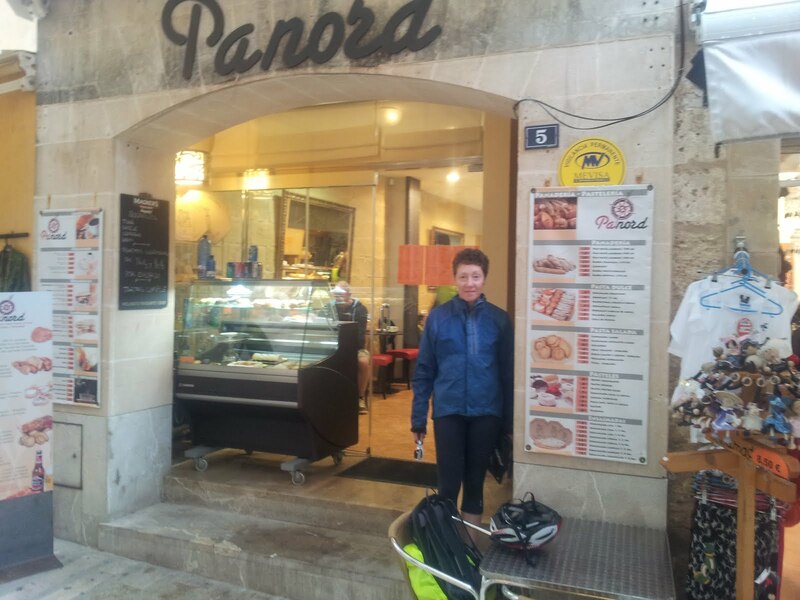 We returned to Andrax via the minor road we had failed to find earlier and continued out of the town along the Ma 10 which ran over the col de Gramola and then along Mallorca's western coast line towards Soller. Refreshments were taken at Es Grau . An excellent view from the terrace but you needed a wind proof top to provide some protection from the wind. The restored watch tower Talaia de ses Animes proved a good photo stop. We left the coast just after Banyalbufar . Lyn reports the 9km along a minor mostly single track road to Puigpunyent provided some excellent views. Robert was just pleased we completed the journey without meeting an oncoming car. He was even more releived to find the route continued directly to Palma. We were to late to visit nature reserve but did manage a fruitless Decathlon stop in Palma. For our evening meal we walked down the road to Pepes "Siurell " where Pepes wife welcomed us with a couple of kisses. Todays forecast was rain so we decided on a local ride. We went round the bay to Alcudia and then on the peninsula and the short climb to Ermita de la Victoria . Good views across the bay to Port de Pollenca and Cap de Formentor from the cafe where we had the obligatory coffee stop. We made it most of the way back to Alcudia before the rain started . Lyn remembered a good cafe in the town we had visited last year. It was soon located but this time we were disappointed . The vegetable pasty was good but the pie was lacking in taste and the staff had forgotten the smile part of "service with a smile". The sound of thunder delayed us setting of back. We sheltered in a couple of shops before the rain stopped .It was then a quick ride back round the bay. The rain held of long enough for us to research a couple of restaurants in the town . It was then time to head back before we got too wet. A round trip of 21.42 miles. The forecast for tomorrow is poor but then it is scheduled to improve. Earlier in the week ran had been forecast for Thursday . We awoke to a fine day and and a good forecast do decided to do a ride from Santa Margaluda. As in previous years we parked at the football stadium on the edge of the town. We had planned a ride along the beautiful Bosch valley . Before we could get there we had to follow the ecovise to the ma3400 and then to the ma12. The later had quiet busy but had a wide tarmac verge to cycle on and it was only a couple of miles before be took small track which then joined the ma3330 towards Petra. After about 6 miles of climbing we then turned and dropped down to the Bosch valley . We then headed towards Mancor but a couple of miles before we got there decided to add a loop to Santa Llorenc des Cardassar so took the minor track Cami de Son Ramon . This took us to the ma3323 which we followed to the town. lunch was had in local bakers . 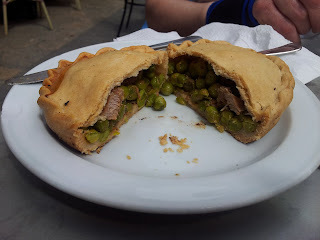 An excellent pasty filled with onion and a Panada filled with chicken and peas . We were even shown their special oven they used to cook the pies in. It had a large circular base that could be turned to fill and then remove the cooked pies. In full swing it could have kept most of the island supplied. Other was then onto Mancor via the scenic route .We had then planned to take the ma3320 to Petra but could not cross from the cycle path which rang alongside the main road. Next time I would go Bosch up the Bosch valley . We had to follow the road for a couple of miles further than planned we could cross and headed to Petra. There was time for an icecream in bar before we headed back on the cycle path to Maria and then Santa Margaluda. A round trip of 58 miles. with Roberts special breadcrumbs ! The weather forecast was good so we selected another ride. This time we drove to Biniali and parked in our usual spot by the roundabout . We took the minor road and then the mountain bike track towards Sencelles , the route then went via Ruberts , Llloret de Vista Alegro ,Montuiri , Porres ,Llucmajor ,Algaida , Biniali a round trip of 43 miles.Took a wrong turn when going towards Montuiri , this added a few miles and a short climb to the route. I planned the route to arrive in Montuiri at a suitable time to stop in the bar by the church with its views across the countryside from its terrace. We arrived at 1 , a suitable time for a small beer and plate of "pa amb oli " bread rubbed with olive out served with cheese tomatoes and serrano ham. The back roads to Porres were pleasant but the main road we had to take to Llucmajor although very quiet Lyn found a bit of a slog especially as it had a long hill to ascend . Stopped in Algaida for a coffee before completing the last 6 miles back to Biniali. The temperature peaked at around 21 degrees with the sun shining for most of the day. After breakfast it was back to Bruce's to get my saddle changed. The shop was not as busy and Mark soon had me on my way again. This time with a far more comfortable seat . A fine day was forecast so we set off on ride taking the back roads to Campanet . When we reached the "cross " just before the climb to Campanet a small fate was taking place . We took advantage an were soon tucking into quiche ,orange cake and chocolate cake . The disadvantage of this was Lyn then announced she would not want a cake when we got to our favorite cafe in Muro! From the cross it was then up the hill to Campanet then onto Buger and then the back roads and minor tracks to Muro . Climbing the hill Lyn got her appetite back so was able to manage half a pie with peas with her coffee . After Muro it was the back roads and minor tracks around Sa Pobla then back though the Parc Natural S'Albufera and we retraced Monday ride back to Puerto Pollenca . As the day went on it got hotter and I had to unzip my sleeves in the afternoon. Awoke to rain but it had stopped by the time we had had breakfast and set off. As it was Easter Monday we checked the time the supermarket shut before heading to Procycle Mallorca to get our bikes. They were very busy and every bike they had was reserved . We were served by Bruce 's wife. A Danish tourist had just come off one of their top of the range bikes and had phoned in to report the accident and this was causing a distraction in the shop. Our reserved bikes were located, our pedals put on and Roberts handle bar top swapped for one with longer reach. Bruce did the final adjustments and gave us a couple of water bottles. We opted not to take the additional accidental damage insurance. At 15 euros for 2 weeks good value if you had hired a top of the range bike but not for our old hybrids . 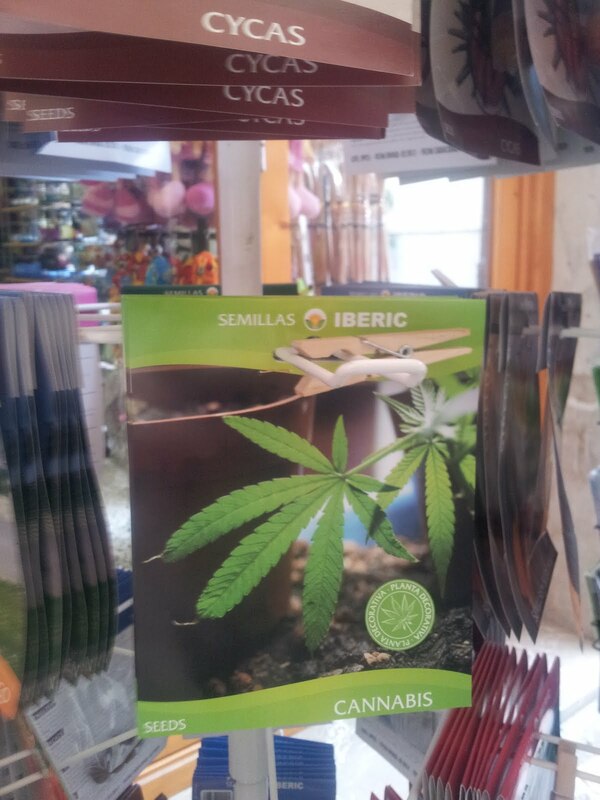 Next was Lidl in Pollenca for provisions. A full trolley including beer and wine came to 91 euros. We had a late lunch of home made pizza. There was not time for a long ride so we took the back roads to Parc Natural de D`Albufera. Watched the birds from a hide and then cycle round the park and then returning by the same route. A round trip of 28 miles . 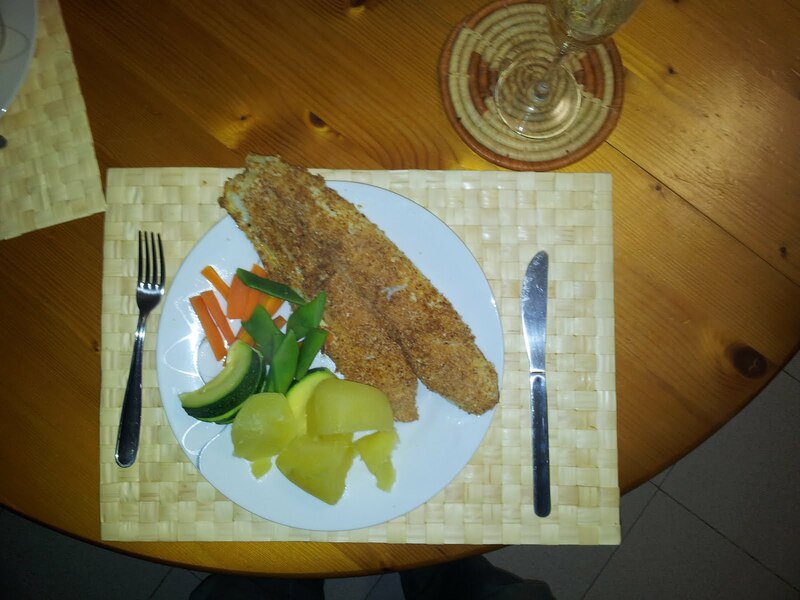 Tea was freshly breadcrumbed fish with seasonal vegetables . Whilst we were cooking it Margarita called by with Peter her new fiance . We settled our bill and had a brief chat. The apartment has had a couple of additions since our last visit. We now have a new kettle , toaster,coffee maker and new saucepans and utensils. However the bottles of Balsamic vinegar we let in 2011 and again in 2012 have now gone so we had had to buy another for 2013! Our Jet2 flight to Palma departed about 1 hour behind schedule. The delay easy caused by the baggage handlers being slow to put through bags on the plane. Fortunately the pilot decided to wait and we were able to watch of cases being amongst the last to be loaded . 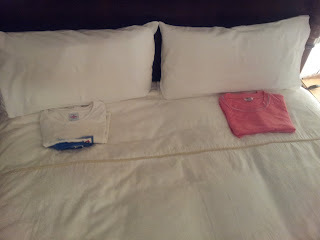 We had been asked if we had wanted to check in our cabin bags but sensibly declined. An uneventful flight and we were soon important Palma "1 hour ahead of the wrong time the pilot gave us. He added the extra hour twice." There was not delay in getting the casessions and within 15 minutes of touching down we were getting the keys for our Renault Kangoo van. With typical German efficiency from Sixt and we were on our way. We arrived in Puerto Pollenca at around 9:15 and had time to walk the mile to the town centre . The chip shack was shut so we had a beer and pasta snack in a cafe instead .